pwned experiments: When there's nothing left to burn, you have to set your radioactive acrylamide electrophoresis apparatus on fire! 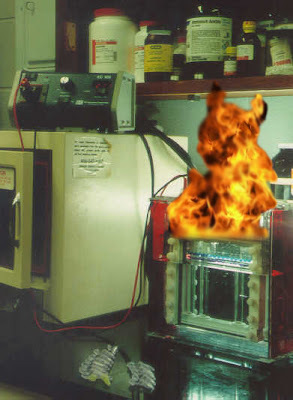 When there's nothing left to burn, you have to set your radioactive acrylamide electrophoresis apparatus on fire! **Note: this is photographic re-enactment, and does not represent the actual event described. "During my Master's research a few years ago, I was running many acrylamide gels, to examine small differences in sequence length of some DNA markers. To visualize the results on X-ray film, I was labelling the DNA fragments with radioactive 32P. The gels themselves are made of a lovely mixture of acrylamide, urea, and formamide. Urea isn't so bad, but formamide is toxic and flammable, and acrylamide is my favourite chemical because it's a known neurotoxin and suspected carcinogen, which translates to "the brain lesions kill you before the cancer has a chance to metastasize". When running, the gels, loaded with radioactive material, run at about 2000 volts for a couple of hours. One day I came into the lab, set up everything as usual, then departed to do something else while the gel was running. I came back to an empty lab to find smoke emerging from the electrode terminals on the top of the gel rig. Buffer and some gel material had leaked out, reducing the electrical contact area to a tiny droplet of buffer, which overheated and started the plastic structure smoldering. Cleaning up that mess was almost as much fun as the time my thermal cycler crapped out all of its coolant fluid (ethylene glycol) onto the bench top while running radio-labelled PCR." It's not far off, though.